By Katharina Fiedler, Louis Jacobson on Monday, April 27th, 2015 at 4:03 p.m.
Former Florida Gov. Jeb Bush speaks at the First in the Nation Republican Leadership Summit on April 17, 2015 in Nashua, N.H.
There’s little question that President Barack Obama has faced a rocky foreign-policy landscape during his tenure. But is he philosophically opposed to having the United States take a leading role in the world? That’s what former Florida Gov. Jeb Bush has said on the stump. 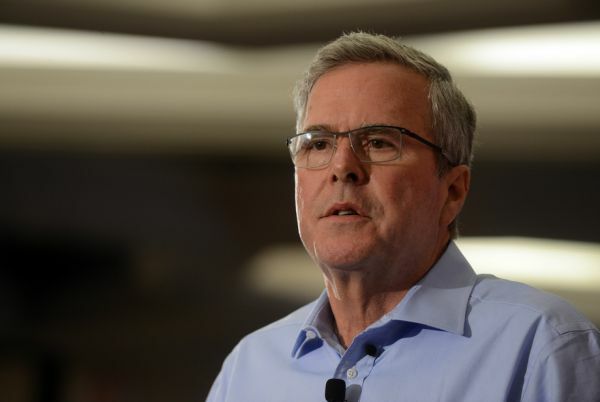 Bush is expected to seek the Republican presidential nomination in 2016. "The question that we have in front of us is, are we capable of making disruption our friend, or will it overwhelm us? And that requires the leadership to fix a few big, complex things. None of this is going to be possible, unless we restore a sense of security in the lives of Americans, a sense of security that is based on American leadership in the world. "This is the first president in the post-World War II era that does not believe that America's presence in the world as a leader and America's power in the world is a force for good. I do, and I hope you do as well." Bush’s comments that Obama "does not believe" that "America’s power in the world is a force for good" caught our attention. We thought we remembered Obama making high-profile comments expressing just the opposite. We took a look at Obama’s words and found a number of speeches in which he said something very different than what Bush indicated. We’re not putting this claim on the Truth-O-Meter now, but we will be monitoring campaign rhetoric along these lines to see if it sticks to the facts. • Speech at the graduation ceremony at West Point, May 28, 2014: "America must always lead on the world stage. If we don’t, no one else will. … Let me repeat a principle I put forward at the outset of my presidency: The United States will use military force, unilaterally if necessary, when our core interests demand it -- when our people are threatened; when our livelihoods are at stake; when the security of our allies is in danger." • Statement authorizing airstrikes and aid for Yazidi minorities in Iraq, Aug. 7, 2014: "Our leadership is necessary to underwrite the global security and prosperity that our children and our grandchildren will depend upon. … When the lives of American citizens are at risk, we will take action. That’s my responsibility as commander-in-chief. And when many thousands of innocent civilians are faced with the danger of being wiped out, and we have the capacity to do something about it, we will take action. That is our responsibility as Americans. That’s a hallmark of American leadership." • Speech from the White House on combating the Islamic State, also known as ISIS, Sept. 10, 2014: "American leadership is the one constant in an uncertain world. It is America that has the capacity and the will to mobilize the world against terrorists. It is America that has rallied the world against Russian aggression, and in support of the Ukrainian peoples' right to determine their own destiny. It is America that helped remove and destroy Syria's declared chemical weapons so they cannot pose a threat to the Syrian people -- or the world -- again. And it is America that is helping Muslim communities around the world not just in the fight against terrorism, but in the fight for opportunity, tolerance, and a more hopeful future." • Obama’s Nobel Prize acceptance speech, Dec. 10, 2009: "Where force is necessary, we have a moral and strategic interest in binding ourselves to certain rules of conduct. And even as we confront a vicious adversary that abides by no rules, I believe the United States of America must remain a standard bearer in the conduct of war. That is what makes us different from those whom we fight." • Remarks on the Ebola crisis, Feb. 11, 2015: We have this extraordinary military. We have an extraordinary economy. We have unbelievable businesses. But what makes us exceptional is when there’s a big challenge and we hear somebody saying it’s too hard to tackle, and we come together as a nation and prove you wrong. That’s true whether it’s recession, or war, or terrorism." • Speech at the Summit of the Americas opening ceremony, April 17, 2009: "While the United States has done much to promote peace and prosperity in the hemisphere, we have at times been disengaged, and at times we sought to dictate our terms." • An op-ed by Obama, April 16, 2009: "Too often, the United States has not pursued and sustained engagement with our neighbors." • Remarks at a town hall in Strasbourg, France, April 3, 2009: "In America, there's a failure to appreciate Europe's leading role in the world. Instead of celebrating your dynamic union and seeking to partner with you to meet common challenges, there have been times where America has shown arrogance and been dismissive, even derisive." These examples, however, don’t undermine Obama’s comments that the United States has a special leadership role in world affairs. Even though we aren’t giving this claim a rating, we’re skeptical that a few claims acknowledging past excesses or shortcomings in relations with America’s allies -- most of them spoken early in his tenure -- trumps Obama’s repeated emphasis on the United States’ positive leadership role in the world.